On November 27, a finance seminar with the topic of “Credit Default Swaps Around the World: Investment and Financing Effects” was held at the LG-POSCO Business Hall, with Professor Jongsub Lee (Department of Business Administration, Seoul National University) as a speaker. 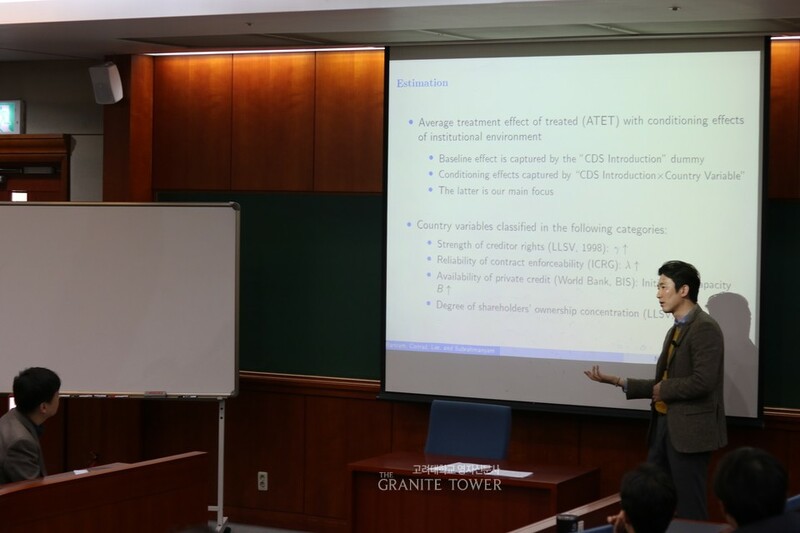 Throughout the seminar, Professor Lee talked about Credit Default Swaps (CDS) and elaborated on specific problems and visions about it. The professor first started the lecture by giving the definition of CDS, then he gave some examples that made CDS fail to trigger, including the Greek solution to their economic difficulty. He stated that even International Swaps and Derivatives Association (ISDA) was not able to make clear decisions, because there were certain cases where CDS was not distinctly cut. He also mentioned about the data usage of CDS in companies, stressing that since each of precedents have different backgrounds, an application by referring to them may not be perfect. After covering the failures of CDS trigger and its fundamental problems, Professor Lee then move on to how people handle with these problems. He explained that inconsistency between the contract definition of CDS and local legal environment creates uncertainty in payments on credit obligations. He then stated that they actually take probability into account, in which the governments compute the propensity, and based on the score, do the inverse weighting. When asked by an audience that such method does not seem to address the outer sample, Professor Lee explained about the “killer confounder,” which is a system that makes a situation into a two-by-two scenario, and fits into each probability. In the end, the professor briefly showed various statistical data that shows the ambiguity of CDS, as mentioned above. After showing it, he concluded the lecture by emphasizing the significance of CDS and its influence in various markets.